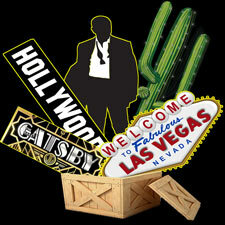 Props are avaiable for hire with your fun casino package or on their own. Dave, Lou and Tracie made our party with their fun casino tables. Professional yet they felt like part of the party. Our guests loved it. Blackjack Casinos are extremely easy to deal with. I have used them for the last 2 years at our company corporate events and can trust them to arrive, set up, manage the casino and leave without me needing to worry about checking anything. They are true professionals and their communication is great. Feedback from our guests has been brilliant and the tables are always full all night. The 'funny money' is a brilliant touch too. 10/10 would recommend. Absolutely a must !! so professional, well organised and a very friendly team !! Loved it that much i had to book again within a week !! Absolutely AWESOME - Thanks so much for a great night at our Wedding!!! Very professional, friendly service. The croupiers on the night joined in and had fun with the team, whilst maintaining a very professional manner. Booking was easy and the personalised 'funny money' went down a treat. We had a James Bond Casino Night. It was amazing The setup was quick and easy, we hardly had to do anything. The personalised money was a great touch too. Dave was a great host and was great getting newbies to Casino involved. I highly recommend! I hire the casino for my 60th birthday party, the croupiers set up well beforehand, were dressed to match the party and great fun. My guests enjoyed the tables so much that the dance floor was empty!! Would definitely recommend to anyone wanting some great casino fun. Fantastic service, very professional and trustworthy. Even the smaller details like remembering the players names made the whole experience very special. Thank you. We have used Blackjack Fun Casino for our Yr11 Prom for the last two years and they have been fantastic. The props they supply as well as the different tables are excellent and really add to the event, the fact they can cater for lots of different themes is a real bonus. The staff are friendly and helpful, they interact well with the students, making sure they have a great time. We would definitely recommend them and intend to use them again next year. I hired Blackjack Fun Casino for my 40th birthday and the service I received was exceptional from my initial web enquiry through to the night itself. Dave and the team are extremely accommodating, experienced and professional. They were responsive on phone and email and the booking process was really simple. They had great ideas to make the night really memorable and the props I hired from them were fantastic and great value for money. I would definitely use them again and would not hesitate to recommend them. We hired Blackjack Fun Casino for our wedding reception and we couldn’t fault them. The organisation of it was just brilliant and everyone had a fantastic time... even the kids got to play. Della & Nadia, our croupiers, were also amazing. If you didn’t know how to play they explained it to you in simple terms. We had blackjack and roulette and both tables were full for the entire evening. Would 100% recommend and would hire them again. Thank you All again. I booked a blackjack and roulette table for our works Christmas party. We all had a great time! Brilliantly organised from start to finish. Lou was great and explained all the games and got everyone invovled. Would highly recommend. 16/12/16 - Office Christmas Party - this was a fantastic evening, made all the more fun by having the Las Vegas themed casino and props supplied by Blackjack Fun Casino. I would sincerely recommend this team of very professional individuals! 15/12/17 - we used the same company and once again the event was fabulous! We used Blackjack Fun Casino for our work Christmas party. They were amazing and everyone had a very enjoyable and memorable night. Would hire them again without hesitation. We hired Blackjack Fun Casino for our wedding this summer. It was a massive hit with all our guests.... old and young! We can't thank them enough for entertaining everyone throughout the evening. The tables were full size, exactly as you would find in a casino and Lucy and David were fantastic! A lovely touch was the 'funny money' that we were able to personalise with a photo of us. 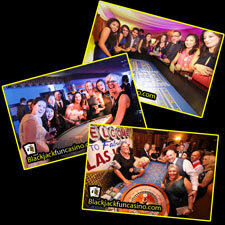 We would highly recommend Blackjack Fun Casino for your event! Thanks again! Our Christmas Party clients love what we do! 74 5-Star reviews and counting on Facebook! Blackjack Casinos are extremely easy to deal with; they are true professionals and their communication is great. I have used them for the last 2 years at our company corporate events and can trust them to arrive, set up, manage the casino and leave without me needing to worry about checking anything. Feedback from our guests has always been extremely positive and the tables are always full all evening. The 'funny money' is a brilliant touch too. 10/10 would recommend. 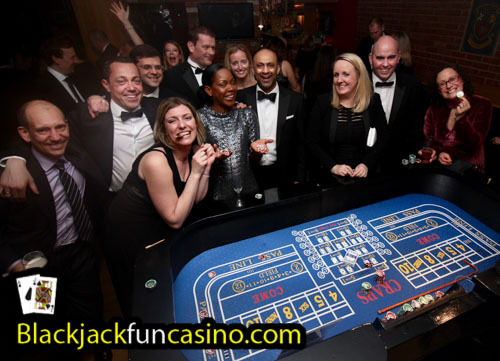 We used Blackjack Fun Casino for my 40th back in December and they were absolutely brilliant! If you ever want a casino for an event this is the company you want to use. The props and tables made the venue look perfect. The communication with the company was easy and nothing was too much trouble. And the croupiers were exceptional. Really friendly and helpful. Everyone had a great night. An enormous thank you for making my celebrations so memorable! This team is amazing, friendly, professional, I have to say one of the best suppliers I have used. Would like to thank you once again !! Se you soon!! Absolutely fantastic from start to finish! When organising an event for over 500 people, knowing that Dave and Lucy had this casino side of the event under control meant there was one less thing for me to worry about. This company is definitely one of the best companies I have ever used and worked with and I would 100% use them again and recommend them to anyone. We hired the Magic Mirror and 3 casino tables for our annual Charity Ball. The event went really well, Dave was extremely efficient in setting things up and a very engaging host on the mirror. The croupiers were also excellent and the tables and mirror seemed busy all night (so busy in fact that it took me a long time to get on a table and lose my money!). There is nothing I can think of which would have improved our experience and we will certainly use you in future and would thoroughly recommend you to others. We have hired these guys on multiple occasions for our Charity Ball's and have always had a great experience. From communication, to booking, to the actual event. A great company with great staff. Thank you Blackjack Fun Casino. We would definitely recommend and no doubt will use again! Amazing service, really friendly staff and the fun money was a lovely touch. Would definitely use again and happy to recommend. Hired a blackjack and roulette table for my 21st birthday in August, they were very professional and friendly and everyone commented on how much they enjoyed playing them. My dads booked them again for his works Christmas party in December, highly recommend, thank you. 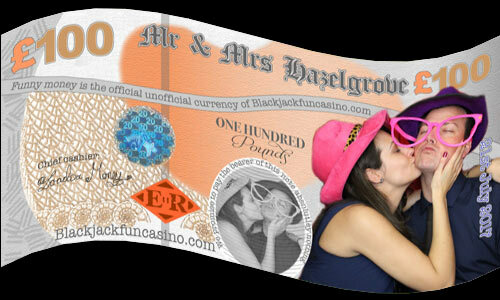 We had the Blackjack Fun Casino at our wedding, it was absolutely amazing. The people who run it are so friendly and helpful. We'll defiantly be having it again, loads of fun. Second time we have used Blackjack Fun Casino. SO well organised, the staff work so hard, are really lovely and are so good at what they do. 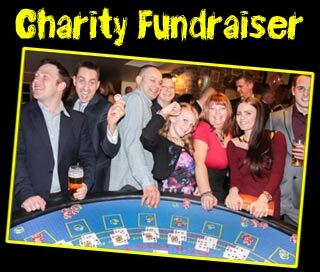 Our Casino Night is becoming the highlight of our year! Thank you Blackjack Fun Casino! Wow! What a fantastic night! Professional, friendly and fun staff who clearly love their job with excellent props and equipment. Everyone loved the evening, including those who’d never tried playing before. I highly recommend this business. Would highly recommend these guys. We had them for my brothers surprise 40th and they were amazing. All our guests loved it and the organisers really made playing fun. Myself and my new husband Adam would like to thank you and your team for providing the casino on our wedding day all our guests loved it and so did we! We couldn't fault the service we received and were very impressed by the professionalism and layout out of the casino games and staff. We loved the funny money and enjoyed having the option to personalise it ourselves. The timings were perfect and we loved watching everyone having fun and getting stuck in, we only just had time ourselves to get a quick game in but found it lots of fun! 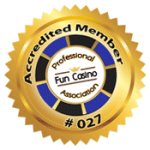 We would highly recommend Black Jack Fun Casino to our friends and family. 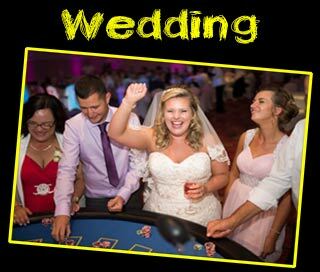 We hired Blackjack Fun Casino for our wedding in July 2017 after having had such a good time playing the tables at a friends wedding. They were quick to respond to queries we had, printed personalised fun money for our guests with our photos on and even gave the winning guest a bottle of champagne. We hired the Blackjack and Roulette table and they were pack for the full 3 hours. A great addition to the day, our guests loved it! Highly recommended. Booked another casino night with these guys - this time for my husband Petes 50th party at Grosvenor rooms in Sutton in Ashfield. Fantastic night. 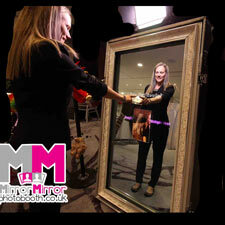 So professional and entertaining and the 'Magic mirror' was a huge success with everyone. Can't wait for the next casino night. Would highly recommend these guys to anyone! I've been working in the entertainment business now for a little under 20years, I've seen many people come and go, now I've worked with this team on more than one occasion and they never fail to entertain!! These are true professionals from start to finish, trust me if you're after a casino themed night, don't bother looking anywhere else. We hired the casino table for our wedding and it was an incredible experience! Everyone commented on how enjoyable this service was and I don't think there was a single person at the wedding who didn't take part! My husband would not come off the table all night! We would like to thank Dave who was amazing on the night! We think our nephew enjoyed it the most especially as he won at the end of the night and he is only 7!! Thank you so much! We would definitely recommend to anyone thinking of booking!!! Thank you for the casino at our wedding last night, our guests loved it! Had an absolutely fantastic night last night at our wedding reception and hiring you guys and your roulette table was definitely the best choice . Fantastic staff and everyone loved it especially David who won the champagne �. Would recommend this company to anyone for any special occasion they were fantastic . Fantastic! The croupiers were fantastic! They made my husbands 40th even more special! Dave - was fab! A really good laugh! Thanks ! We had a fabulous party with the Blackjack Team for a '90' - joint '30' & '60' birthdays. 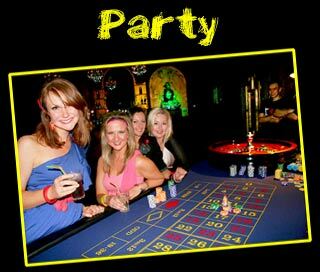 The Casino was great fun - brilliant addition to the party, the staff were very professional & charming with it! A very big thank you & a huge recommendation. Booked these guys at the very last minute for our wedding and I'm very glad we did. From start to finish they provided a professional service and were so easy to deal with. After the ceremony they were set up and ready to go. Great tables and staff suited and booted to match. Very friendly staff who engaged with our guests and ensured they all had a great time playing. Cant recommend these guys highly enough. Thanks for being part of our big day. Andy & Penny. We hired blackjack fun casino for my 21st a few weeks ago and they were excellent. The tables were brill and the staff were very friendly. Thoroughly recommend. We used the casino hire for our wedding last year in June and it was amazing. We hired the blackjack and the roulette tables for 3 hours each. The price was reasonable and the service I received from Dave was fantastic, he was great at every point in the process. My husband was sceptical about whether they would get used and he couldn't have been more wrong! They were packed the whole night and offered entertainment for anyone not wanting to get up and dance so they weren't sat at a table looking bored! Also loved personalising our money with our photo and wording... couldn't recommend more! The banter was flowing, treated as friends rather than customers. Fabulous night had by all. 5 � is not enough. Professional entertainment. Massive thank you on behalf of all of the guests at our James Bond Christmas Ball. The props were brilliant and the casino tables were very well received. The staff were very easy to work with very helpful and very professional. Your presence was much appreciated and I look forward to hiring you again for whatever the next function may be. Thanks Dave and have a good christmas. Excellent service, very customer centric, very personable. Created the "wow" factor we were after. Would highly recommend. An absolutely fabulous evening had by all attending the Shirley Marie Curie Charity Ball. Dave and his team supplying amazing entertainment to our guests helping us raise over £6000! Already booked again for next year. Thank you. We had two tables at our wedding which were amazing! The staff that came were fantastic, very professional and built up an amazing rapport with our guests. All of our guests thoroughly enjoyed the tables and complimented the staff. Thank you!! These people can't help enough, very responsive and so helpful, and the delivery was so quick. The money is so great! Absolutely love it, thank you so much !! The bride and groom have got such a surprise coming!! Thank you Dave and Louise! Your professional and friendly service of the roulette and blackjack tables greatly contributed to the success of our daughter's 21st birthday party. Everyone who took part really enjoyed them and had a lot of fun, without losing any real money! A great service and I would highly recommend. We booked the roulette table and blackjack table to entertainment at our wedding reception and it went down a storm our guests loved it. The 2 lovely ladies working on the tables were friendly and had got everybody involved. I would highly recommend them. This was an excellent addition to our wedding. We had so much fun and so did all our guests. I highly recommend this at any event where you want people to mingle. This bought both our families and our friend together. Thank so much. I booked Blackjack Fun Casino for my 50th birthday party in March and it was a runaway success. Lou and Dave provided great communication, and on the night all my guests had loads of fun playing the tables some even winning thousands of pounds., even my aunty who is 80 enjoyed it . I would highly recommend them for any event, it's great fun and very entertaining. We had the fun casino (roulette and blackjack tables) at our wedding on 30th January. The service was outstanding, right from prompt replies to our initial enquiries through to the actual event. The croupiers were excellent, making such a good atmosphere for our guests. The funny money is a must have, and gave a chance for our guests to be told that it was just for fun and they could keep all their money in there pockets! The only problem is that we didn't get time to speak to some of our guests as they were so engrossed in gambling! Would definitely recommend blackjack fun casino to anyone looking for a little bit of extra entertainment at their wedding. Booked Dave & his team as entertainment for a corporate event my business sponsored. Dave was great in all areas, in the run up to the event, on the day / night itself (including plenty of banter with a boisterous crowd ). I'd definitely use these guys again and wouldn't hesitate to recommend them. Cheers guys!! We had Blackjack Fun Casino during our recent Christmas Party and had such a great time! The whole team was very professional and they made our night so enjoyable! We set up a room at the first floor of our venue and it turned out to be a perfect Casino! Everyone had a great time playing blackjack and roulette. 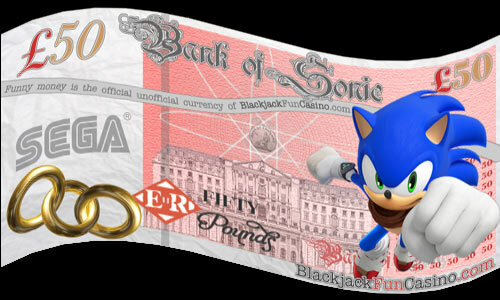 Moreover, our customized fun money was brilliant! 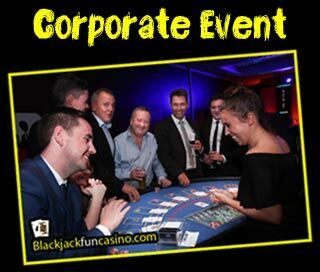 We definitely recommend Blackjack Fun Casino Hire!! Blackjack Fun Casino provided the casino tables for my 21st Birthday party and did an excellent job! The tables were all set up well in advance on the day and they were very friendly and helpful during the organisation of arrangements before the event. The croupiers were fantastic and very professional, offering help and explanations to those who didn't understand the game. The tables were a huge hit and I would definitely recommend Blackjack Fun Casinos. Thank you so much for helping me celebrate my birthday! Fantastic, professional service from Dave, Lou and Zoe, everyone loved all the James bond props and the casino tables. Many thanks again to you all for making our party so special. Hired for an 18th birthday, was a huge hit. A really professional set up and made the night. Would highly recommend! Thank you to Dave and team for providing the casino tables for the Winter Ball in January 2015. The students loved the tables and the service on the night was outstanding. Planning was made very simple and Dave was very accommodating of our requirements. THANKS AGAIN! Thank you so much for being a part of our event on the 8th of July 2014. Dave and the ladies were great and our guests had a lots of fun. Communication with Dave was very easy and professional. Every game was explained properly and so were able to enjoy it. "Funny money" were just a great addition to this amazing night!!! We had Lou and Dave at our wedding a couple of years ago and they were absolutely amazing. Very interactive and good teachers for novice gamblers. All our guests loved them so much our dance floor was empty!! Fantastic contribution to our party, thanks. Organising a surprise birthday party? 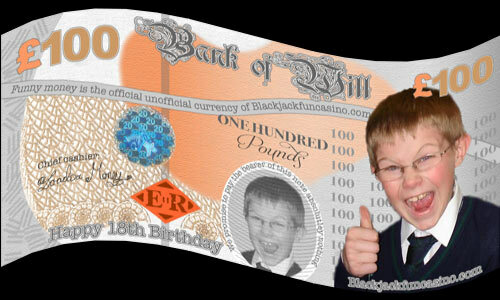 We can personalised your fun money with your photo. Change the wording or photo? A nice crisp £100 note? A nice touch to keep the company branding throughout your event. Click to see our full range. A Photobooth with Bells on! We feel this is the most important page on our website… Showing you what to expect if you decide to book with Blackjackfuncasino. On a budget or organising a smaller party or home party? Why not book a DIY Casino for your event. Click for more info about DIY Casinos. TV producers chose our company for the quality of our equipment and the friendliness of our staff. 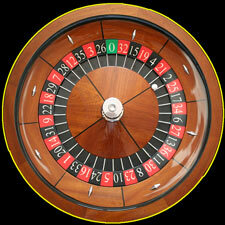 We have also provided fun casino entertainment for a celebrity wedding that was covered by Hello Magazine!